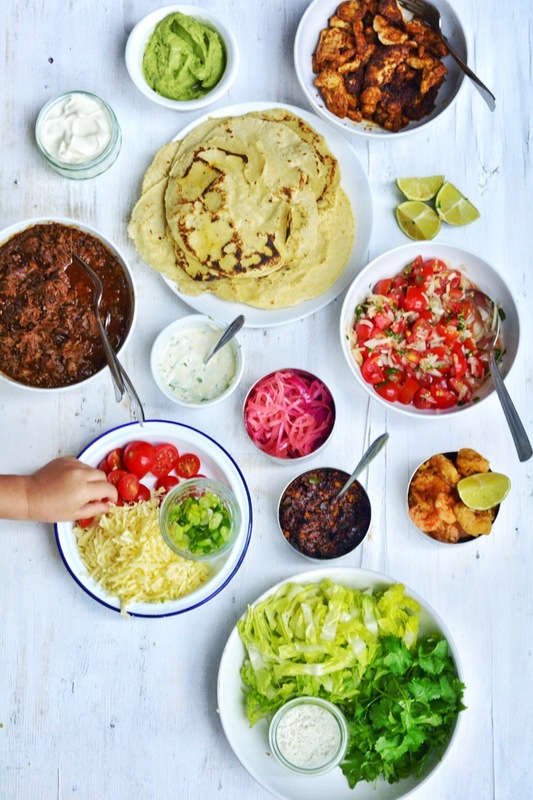 We’ve recently started taco evenings with the children and they’ve been a roaring success. I suppose it’s the spread of food in front of them and the feeling of building your own meal that appeals to them. We’re sharing everything together and I think it means they feel quite grown up and part of the fun. Usually, I’ll just make a chicken dish seasoned with cumin, oregano, chilli and other bits and pieces (we call it taco seasoning, it could be called adobo spices), but this time I got the heavy guns out and went a bit nuts. There was plenty left over which went in freezer bags for next time, so it wasn’t as crazy as it looked when I lay it all down. I’d suggest picking one or two dishes depending on how many people you’re feeding and depending on how long you want to spend in the kitchen. I was in a food frenzy, you may not want to be. Homemade corn tortillas, guacamole, pico de gallo, adobo sauce, chicken with taco seasoning, red onion pickle, sour cream, slow cooked shredded pork cheek with barbecue sauce, fried prawns with Old Bay seasoning, lime and coriander mayonnaise, shredded gem lettuce,spring onions, coriander leaves and lime wedges. The children loved making the tortillas though, and if you don’t have a tortilla press (they’re cheap and available on mexgrocer.co.uk along with almost everything you may need for mexican receipes) you may want to save yourself the bother and buy corn tortillas ready-made. Of course, they’re not as good and often have wheat flour in but if it saves your nerves from becoming as shredded as the pork, then it’s probably a good thing. The pickled red onion recipe is here, but for the rest (apart from guacamole, I’m not going to bother giving a recipe for that) hold your breath and keep reading. One part masa harina (corn flour) to one part warm water and a pinch of salt. Simply mix the ingredients together until they form a dough much like ‘playdoh’, leave to rest and then form into small balls and press between sheets of plastic (I used a cut up ziplock sandwich bag) on the tortilla maker. Cook on a volcanic cast-iron griddle pan until both sides are tortilla-like then throw on a plate and continue until you have a pile of them. Cover and leave until you’re ready to eat. This is essentially a fiery tomato salsa, but here, I’ve left the cherry tomatoes quite large so it’s a little like a salad. Just mix together a load of chopped cherry tomatoes, some finely sliced onions, a chopped serrano chilli, some fresh coriander, salt and a good squeeze of lime juice. Leave to rest for about twenty minutes before serving. I soaked a large dried ancho and chipotle chilli in hot water for about half an hour then blended it with a thumb of ginger a tablespoon of ground cumin and a pinch of salt. That’s it. It’s pretty intense and sharp, but goes really well with the other dishes. Take one chicken breast and slice it thinly across. Toss it in a bowl with as much as you feel of paprika, pepper, onion powder, oregano, cumin, garlic powder, salt, chilli powder and ground coriander. Why don’t you start with equal amounts of each, see what you like and adjust it from there. Then, as I have done, you can make a big jar of it and you’ve got tacos a-go-go hey presto! Sauté the chicken in a hot frying pan with some olive oil until cooked. Add a splash of water at the end to deglaze the pan and pour everything into a bowl. This is a slow-cooker winner. I now buy all my meat from the incredible Anne Petch at Heal Farm in Devon. It’s close to the supermarket prices and miles above in quality and welfare. She sends it by courier the next day and I cannot recommend her highly enough. I discovered her in Jane Grigson’s ‘English Food’ and was delighted to find she’s online and thriving. I felt I knew the pigs I was eating, and being in London feel much more connected to the food as is possible in a city. Add one sliced green chilli and some dried thyme sprigs and turn the slow cooker onto high. If you don’t have one, you could cook this in a casserole in a low oven for the same amount of time. Make the barbecue sauce by stirring together: 1tsp tomato purée, a pinch of coconut sugar (or brown if you don’t have any), a good squeeze of lime juice, probably about a lime’s worth, a large pinch (depending on the size of your fingers) of garlic powder, some chilli powder, Cayenne pepper, thyme leaves, dried oregano, ground cumin, finely diced onion, chipotle paste, a good splash of Worcestershire sauce, a spoonful of Dijon mustard and some tabasco sauce. As for exact amounts, just trust your nose and instincts. I make mine with varying pinch sizes every time and it’s always delicious. Add the barbecue sauce to the pork cheeks, stir well and cook with the lid on on high for four hours. Cool a little and shred with a pork. Pour into a bowl to serve. This one’s a winner the next day in a sandwich too. Or shrimp, as the Americans would have it, is a version of the famous fish taco. You can buy Old Bay here and I’d recommend a box for the packaging alone. I made a quick batter with flour, sparkling water and a good few spoons of Old Bay then deep-fried them until crisp. Easy as that. Make some mayonnaise and stir in some lime juice, lime zest, pepper and chopped coriander. What else do you want to know? And that’s pretty much all you need for a taco party. Just make sure you’re wearing elasticated trousers and have no plans for the evening. Even if you’re having these at lunchtime.